These 10 global companies are investing the most in innovation, according to a European Commission report. The world's biggest companies are pouring ever larger sums into research and development despite the uncertain economic outlook. Total spending by the top 2,000 companies hit $711 billion in 2012, an increase of more than 6% over 2011. Autos, tech and pharmaceutical firms continue to dominate the list but there are a few surprises. For the first time since 2004, a European company holds the top spot. Volkswagen (VLKAY) spent nearly $13 billion in 2012, boosted by its acquisition of Porsche. It ranked third in 2011. Volkswagen unveiled what it called the "world's most fuel-efficient car" earlier this year. European automakers and component suppliers are increasing spending on R&D at a much faster rate than their U.S. competitors, the survey found. The EU Industrial R&D Investment Scoreboard is published annually. It's based on 2,000 companies around the world who account for more than 90% of total corporate R&D spending. It measures the cash investment funded by the companies themselves, excluding R&D funded by contracts with third parties such as governments or other firms. The data is taken from the most recent annual reports, usually for the 2012 calendar year or fiscal 2012/13. The companies are based in the EU (527), the U.S. (658), Japan (353) and other countries (462) including China, South Korea, Switzerland, India, Canada, Australia, Israel, Norway and Brazil. The survey was published in euros, based on exchange rates at December 31, 2012. 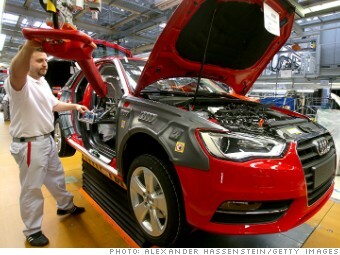 CNNMoney used a rate of $1.32 to convert from euros.